Special recognition was given to Hilltop Campus Village at the annual Main Street Iowa Annual meeting held March 8 in Des Moines. The Hilltop Campus Village is celebrating 10 Years as a Main Street Iowa community. 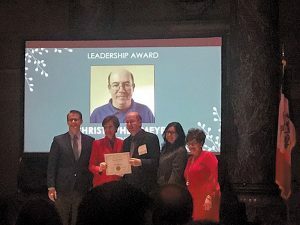 The Leadership award was given to Christopher Meyer. He and his family put in numerous hours each year volunteering at various events in the Hilltop Campus Village. Christopher is also the president of the Hilltop Campus Village promotions committee. 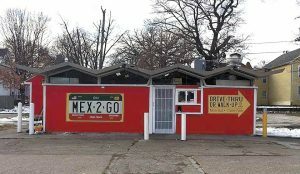 Did you know that Mex-2-Go now has a drive-thru? The food truck featuring delicious Mexican fare, located at 1218 Brady has recently provided a drive-thru lane as well as the walk-up window. Now that spring has finally come, make this a destination place for Mexican meals to go. They are open 11:00 am – 7:00 pm. Closed Sundays. They also provide catering. Call (309) 314-6198. Redband Coffee Co. located at 110 W 13th Street will soon be more than premium coffee, egg breakfast sandwiches and baked goods. They are renovating and expanding their space and menu. Renovations are expected to be complete in the near future. Their coffees include drip, espresso, iced coffee and specialty coffees. They offer a wide variety of whole beans: Blue Devil Espresso, Costa Rica Estate, Decaf Whole Bean, Mexican Oaxaca and Natural Yirgacheffe. 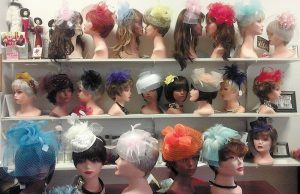 Hats, Hair ‘n Wigs is the place to stop for your Easter Bonnet. Or perhaps you need a new hat or hair adornment for a Derby Party. Stop in at 1518 Harrison and let Gloria show you her spring collection. She loves for you to try the hats on. She is open Tuesday through Saturday from 10:00 am to 5:00 pm. Spring is alive and well in the Hilltop Campus Village. So much so that a Spring Festival is coming to the area on Saturday May 25. There will be an early morning run, a car show behind Greatest Grains, Pop-Up booths and stands in the park, and food trucks, live music and a movie at dusk in the open area at JB Young Opportunity Center outdoor area. It will be a full day of exciting activities for everyone. Come for a spell or stay all day. There is always something exciting going on in the Hilltop Campus Village.